As of March 20, spring is upon us. You can almost smell the grass under the snow, feel the warmth in the breeze, taste the Easter chocolate you will inevitably sneak out of your child’s basket. And if that extra dose of sunshine is giving you the urge to clean, you are not alone. Warm Up. It can be tempting to just jump in and start tackling items off of your to-do list, but it’s important to take a few moments to warm up first. Cleaning can be a huge undertaking, not unlike a strenuous workout, so prepare your body the same way. If you are looking for a quick and easy stretch, try Straighten Up Alberta. Take Your Time. You’ve heard the one about the hare and the tortoise, haven’t you? Choose a pace that is sustainable and be sure to take breaks when you need them. 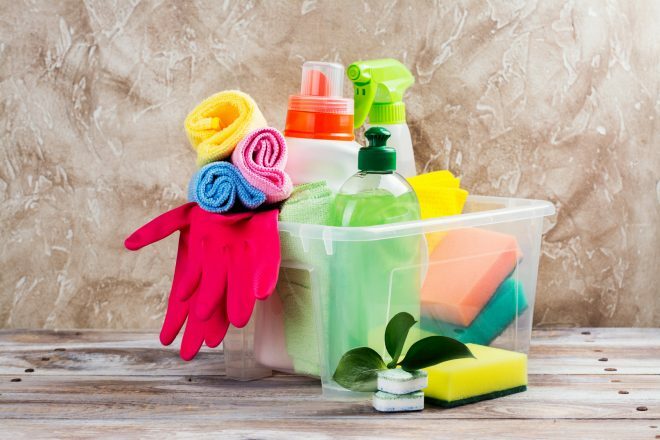 Taking the slow and steady approach to cleaning is likely to get you across the finish line. Taking a fast, hard run at it may tire you out quickly, and can even lead to injury. Stay Hydrated. Dehydration can make you weak and dizzy, which will in turn hinder your ability to clean. Be sure to drink lots of water and/or have water-rich foods on hands to snack on, such as fruit. Get Help. If you are climbing ladders or moving couches, always have another adult on hand to spot or help you. Even the strongest of us can suffer from falling injuries or pulled muscles. Arms, back and shoulders aching? Even with all the right preparation, spring cleaning works your arm, back and shoulder muscles in ways that they are not used to. If your pain hasn’t subsided after a few days, seek advice from a chiropractor. Chiropractors are highly educated and specially trained musculoskeletal experts. Your chiropractor can also give you nutritional advice and whole-body wellness strategies in conjunction with your chiropractic treatment. Consult with your chiropractor, or click here to find one near you. For more news and tips, visit us on Twitter or Facebook.